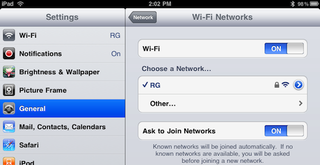 The iPads we bought today don't have 3G guts, so we really need to know: How good is the Wi-Fi reception? Turns out that it's pretty decent, but not quite as good as what the iPhone 3GS gets. My first experience with the iPad's Wi-Fi was right after purchasing it at the International Plaza Apple Store in Tampa, Florida: As soon as I left the store I plopped down into a comfy mall chair, flipped open my MacBook Pro, glanced at my iPhone 3GS, and let my iPad check for nearby Wi-Fi networks. I found that—for whatever reason—the iPad and iPhone detected fewer access points than the MacBook Pro—neither of the smaller devices detected some of the barely-within-reach access points. As I distanced myself from the Apple store's access point the iPad was the first to lose the signal at roughly 120 feet while the iPhone lost the signal about ten feet later. Realizing that the results in a mall full of Wi-Fi access points may not be the most precise, I tried out the Wi-Fi in a somewhat remote local restaurant as well as in my own home—a place free of other signals as my neighbors are luddites—where I also made sure to check 802.11N and 802.11G individually. The results remained the same: The iPad would consistently lose the Wi-Fi signal a few feet before the iPhone 3GS and the MacBook Pro. As far as actually maintaining a connection while in one location, the iPad showed no difficulties and performed as well as its Apple siblings.